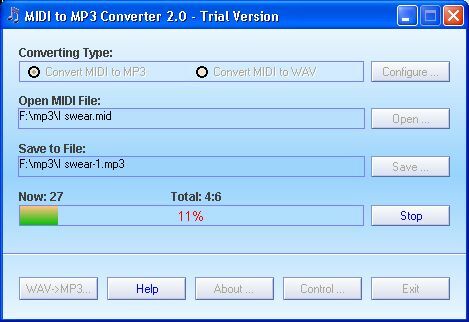 MIDI to MP3 Converter 2.0 - It is designed to convert MIDI to MP3, convert MIDI to WAV. A built-in WAV to MP3 Converter included, so it can also convert WAV to MP3. 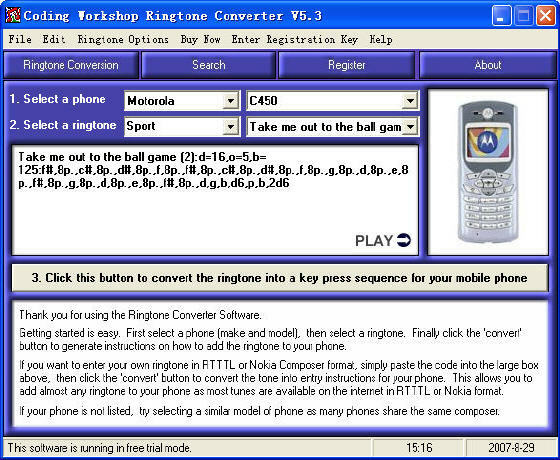 Coding Workshop Ringtone Converter 5.2 - You can add ringtones to most makes and models of phone with this software. Ease Midi Converter 1.30 - Convert MIDI to MP3, WAV, OGG, WMA, AAC, FLAC, and APE in batch. It copies the audio digitally, enabling you to make perfect copies of the original ones. MID Converter 4.2 - You can use MID Converter to convert MIDI files to the most popular audio formats - MP3, WAV, OGG and WMA. Midi2Wav Recorder 3.7 - Convert MIDI to WMA, MP3 and WAV files easily and record your singing into microphone with MIDI playback accompaniment. MIDI to WAV Maker 2.1 - MIDI to WAV Maker is an easy to use tool to convert MIDI to WAV format with CD quality. So after convertingyou can burn the output wav file to CD easily by other tools. MIDI Quartet 1.0 - Midi Quartet is a music composer, a digital 12-channel audio composer, synthesizer, editor, recording studio, and Player. MidiView 1.1 - It is easy to misapprehend some songs when there's no notation at hand. MidiView solve this problem, so you can practice music using professional scores, printed or shown on screen. TS-AudioToMIDI 3.30 - TS-AudioToMIDI is a program developed for automated music recognition. It is able to both recognize pre-recorded audio files and perform on-fly recognition.